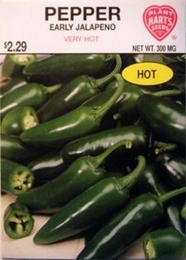 Jalapeno Peppers are famous for being very hot. They are thick walled peppers about 3 inches long by 1 to 1 1/2 inchs wide. Good used fresh, cooked, stuffed, pickled, or dried. Bulk Hot Pepper seed available. 2lbs of Hot Pepper seed needed per acre. 4oz needed per acre if using transplants. On average, 1oz of seed can produce 1500 Hot Pepper plants.